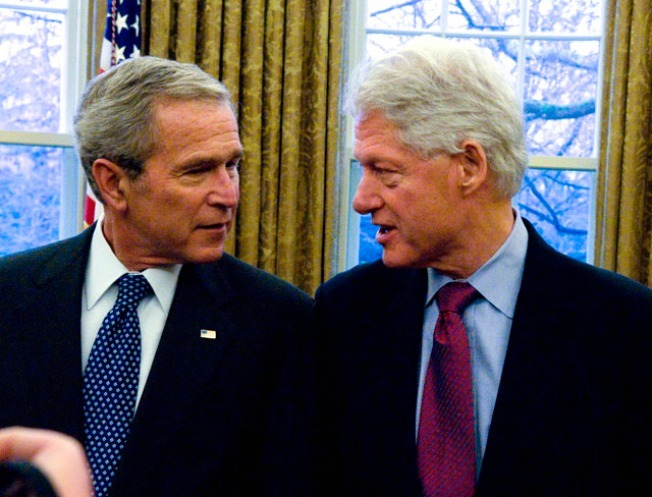 U.S. President George W. Bush (L) talks with former President Bill Clinton during a photo-op with other former presidents and incoming President-elect Barack Obama in the Oval Office January 7, 2009 in Washington, DC. On January 20, 2009 Barack Obama will be sworn in as the nations's 44th president. As presidents, they couldn't have been more different. But in our Video Vault, the two most recent ex-presidents now live side-by-side. Scroll down to watch clips from the inaugural addresses of George W. Bush and Bill Clinton.